The 88 Project, August 25, 2018: In just the two months of July and August 2018, Vietnam has imprisoned 40 people in connection with the nationwide protests on June 10, 2018 over proposed laws on special economic zones and cyber security. Four among them await trial; one has already been tried, convicted, and deported; and 35 others received prison sentences ranging from eight months to 3.5 years. Nine others were tried but received probation sentences. It is possible that even more people are already in detention or will be arrested in the coming months, as police continue their search for those involved in the protests. In some cases, the protesters were convicted on allegations of throwing stone or destroying property, but in many others, the main alleged crime was causing traffic jams. There have been reports of some violent protest methods used in Binh Thuan province, but these reports remain largely unconfirmed by independent media, and the majority of all protests have been peaceful. The imprisonment of 40 in the aftermath of the widespread protests in June 2018 brings the total number of political prisoners being held in Vietnam to 186. Our Vietnamese Political Prisoners Database currently records 146 activists in detention. While we are investigating the 40 new cases and creating profiles for them, their trials and arrests are summarized below. On July 12, the People’s Court of Phan Thiet city, Binh Thuan province tried seven protesters and sentenced six to up to 2.5 years in prison for “disturbing public order.” The authorities accused those protesters of burning government vehicles, damaging property at local government buildings, and throwing rocks, bricks, and gas bombs at the police, who then used tear gas and water cannons to disperse the protest. On July 23, the People’s Court of Tuy Phong district, Binh Thuan province tried and sentenced 10 protesters to prison terms of two to 3.5 years. They were convicted of “disturbing public order” for blocking traffic, throwing stones, and disturbing property. Twenty people were convicted on July 30 in Bien Hoa City, Dong Nai province, with 15 of the 20 receiving prison terms. They had participated in protests on June 10 in Dong Nai province. The fifteen received terms ranging from eight months to 1.5 years. The other five received probationary sentences. All were convicted on charges of “disturbing public order” for allegedly blocking traffic. Female prisoners sentenced in this trial who have sought to appeal their sentences have been threatened against doing so. 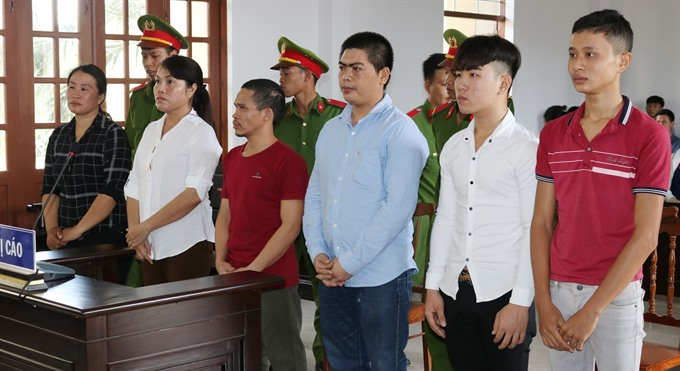 On August 22, six more people were tried by the People’s Court of Phan Rang-Thap Cham city, Ninh Thuan province, also under charges of “disturbing public order.” Four of them were sentenced to between eight months and two years in prison; two were given suspended sentences because they are juveniles. The six were alleged to have blocked traffic, thrown stones at a police station, and used motorbikes to attack police on June 10 and 11. Five men were also arrested in early July, presumably for their roles in or associations with the June protests. They are: US citizen Michael Nguyen, former political prisoner Huynh Duc Thinh, his son Huynh Duc Thanh Binh, Tran Long Phi, and Thomas Quoc Bao. All except Bao are in pre-trial detention, and Bao’s whereabouts are currently unknown. They are charged under Article 109 of the 2015 Criminal Code for “activities against the people’s government,” which is a modified version of the 1999 Criminal Code Article 79. Huynh Duc Thanh Binh himself was a participant in a protest on June 10. US citizen Will Nguyen was arrested in Ho Chi Minh City after taking part in the protests on June 10. He was tried on July 20, convicted, and ordered to be immediately deported from Vietnam. Authorities allege he incited protesters. He maintains that he did nothing wrong. While the authorities accused some of these protesters of using violence, especially in the case of protesters in Binh Thuan province, Vietnamese activists themselves claim that the violence was actually started by the authorities, who sent their own people to mingle with the protesters to start or incite violent scenes which would justify the use of harsher means to disperse the crowd, such as tear gas, water cannons, physical assaults, and arrests. This method, the activists said, would be part of what the Public Security calls Project A2 – Disperse protests and Repress riots. While this claim from the activists remains to be verified, it is true that the police have used brutal violence towards protesters and activists. This has been well documented in the “Black Sundays” report, which details the detentions of unarmed protesters and the physical assault that amounts to torture against them, and calls for accountability from the Vietnamese government in line with international human rights obligations. The 88 Project remains concerned about the imprisonment of peaceful protesters and activists, which is in violation of the universal rights to freedom of expression and freedom of assembly. The democratic process in any nation is improved by a safe civic space that can facilitate peaceful protests that draw attention to economic, social, and political issues within a country. Citizens in Vietnam should be able to express their opinions without fear of assault, imprisonment, or other reprisal. The 88 Project is investigating the known arrests and the allegations of the crimes committed by protesters. In the absence of a free press environment, the protesters should be given the benefit of the doubt, and any accusation by the authorities against them should not be taken for granted. We urge that international human rights organizations and foreign governments condemn the imprisonment sentences against the peaceful protesters the past two months and demand that the Vietnamese government investigates and holds their own agents accountable for committing violence against the activists.